Pat Natale discusses leadership lessons with Casey Dinges. After a long and successful career in both the public and nonprofit sectors, executive director Pat Natale will be retiring at the end of this month. 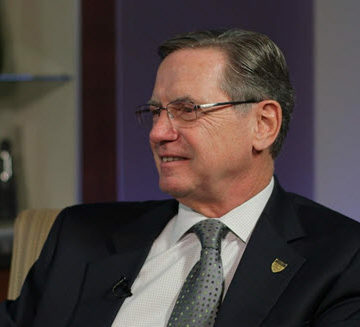 Before he leaves the Society where he has served for a dozen years, Pat agreed to sit down for a video interview (see video below) with Senior Managing Director Casey Dinges and share some of his thoughts on what it takes to reach his kind of leadership success. As a tribute to his dedicated service, ASCE hosted two farewell celebrations for Pat. At an evening Capitol Hill reception, leaders of Congress, the Administration, industry and the association community honored Natale for his leadership in increasing ASCE’s visibility as the voice of infrastructure both in Washington and across the nation. Among those attending were: Rep. Earl Blumenauer [D-Oregon], Deputy Secretary of Transportation Victor Mendez, and leaders from the U.S. Army Corps of Engineers, American Road and Transportation Builders Association, Associated General Contractors of America, National Society of Professional Engineers, American Public Works Association, and Parsons Brinkerhoff. Although he is stepping down, Pat has plans to stay very busy. He will continue to be involved as a volunteer serving on the United Engineering Foundation board. He will continue his ASCE engagement supporting the IMAX movie development. And his newest adventure will be working part-time at Hatch Mott McDonald in New Jersey as their Vice President of Business Strategy. Best wishes and farewell, Pat. Watch the extended version of Pat’s interview with Casey for more reflections on leadership. Great interview Casey, good to see you again and best wishes to Pat as well as many thanks for a job well done. Paul A. Kuhn, Past V.P. Zone !!! 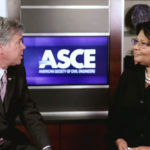 Thank you, Pat, for your many years of dedicated service to ASCE and its members. Your energy and enthusiasm has been contagious and inspires us to do the same in serving the Society and profession we love! I wish you much joy and many years of wonderful memory-making times in your retirement! A big thanks to Pat for his years of service and leadership at ASCE! Thank you for your years of service to ASCE. It has been great working with you. Your energy and enthusiasm rubbed off on all of us. 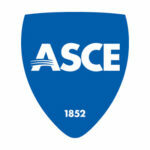 Take care and hope to see you at upcoming ASCE events. Please stop by the Engineering Center if you come up to Boston. Our treat.